New larger format street atlas of Dublin. Clear, detailed street mapping of Greater Dublin, all fully indexed. Route planning map of whole of Dublin area at 8 miles to 1 inch. Main approaches map at 4 miles to 1 inch. The whole of Dublin mapped at 4.4 inches to 1 mile also includes detailed Central Dublin map. 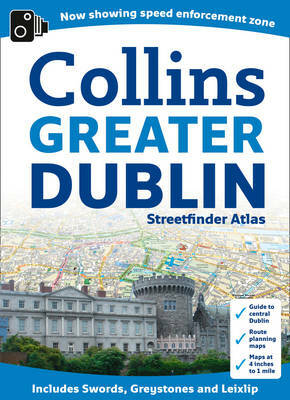 A handy format street atlas of Greater Dublin with clear, detailed street mapping. INCLUDES * Clear colour coded street mapping. * Speed enforement zones. * Fixed safety cameras. * High risk roads as defined by Garda and the National Roads Authority. * Places of interest shown. * Full index to street names. * A comprehensive guide section giving details of Dublin's history, places to visit, local information and useful information for the visitor. AREA OF COVERAGE Covers a large area of Dublin and its surrounding area including Swords, Greystones, Clonee and Malahide, Maynooth, Leixlip, Rathcoole, Ashbourne and Adamstown.